An old "friend" in the Imperial Prison needs to be released... from living. Take good care to avoid the guards. Take the key from Valtieri, and make your way through the sewers. Find Valen Dreth in his cell, and kill him. (Optional) Do not kill any guards. Exit the prison and return to Valtieri. The mini-quest to get the contract from Vicente Valtieri is named "No Rest for the Wicked". Vicente will tell you your next target is Valen Dreth. The name may sound familiar—he was the Dark Elf taunting you inside the Imperial Dungeon at the very beginning of the game. Revenge is a dish best served cold. 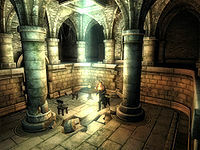 You return to the Imperial dungeon basically the same way that you got out in the tutorial: through the Imperial Prison Sewer to the north-east of the Imperial City. Valtieri gives you the key, which is necessary because the sewer was sealed shut following your escape. Have a few lockpicks handy as there are a couple gates that do not open with the sewer key. Early on there is a detour through a couple of sewer sections that you did not previously visit, but then you'll proceed through the same Sanctum and Imperial Subterrane as before. If in doubt, follow your map marker. Caution is needed in the Sanctum and in the first part of the Imperial Subterrane: guards have been posted to prevent any more prisoners from escaping. All will attack you on sight. To get the bonus you need to be sure to not kill any of them (Detect Life spells or enchantments are useful). Pause for a minute when you first enter the Sanctum to hear the guards' humorous complaints about this new duty. By keeping to the shadows and waiting patiently for the guards to move along it is possible to sneak past all of them. The most attentive guard is the one when you enter the Imperial Subterrane; he is the only one who is carrying a torch and is more actively patrolling. If you're interested, take a slight detour into the room where the emperor was actually killed. You will find a small shrine to the emperor (including items that can be stolen), a dead Mythic Dawn agent with some notes about the investigation, and the guard leading the investigation, Captain Gepard Montrose. Luckily, the captain is too immersed in his own thoughts to notice an assassin sneaking around right behind him. In fact, it is very possible to pickpocket him and acquire all the keys for the prison, but it is not necessary, because they are easily attainable in the next part of the quest. Dreth will be in the same cell as before, across the hall from your former cell. When you first get to the cells, stop and patiently wait for the talkative guard chatting with Valen to leave. If he does not leave, it is possible to shoot Dreth with a bow and arrow from a distance without the guard seeing you. If you pickpocketed Captain Montrose, you already have the key to Dreth's cell. Otherwise, another set of keys are sitting on a small table to the left of the cell. The lock can also be picked. However, once you open his cell be sure to kill him quickly (if possible, with one hit), otherwise he will take off running through the sewers, which leads to a long annoying chase. The other option is to kill him using a bow or destruction magic, in which case you do not need to open the cell door. To get back out, you have two options. You can stealthily return back through the sewer system. Or, using the Imperial Prison Key, you can go up the stairs and leave through the front door. Once you get into the main prison area you are in a public area; being spotted here won't cause you to be arrested or forfeit your bonus. Return to Vicente for a level dependent gold reward (up to 600 gold). If no guards died, you will also receive the bonus Scales of Pitiless Justice, a miscellaneous item that increases your Strength, Agility, and Intelligence attributes by 2 but also reduces your Personality by 2 whenever it is in your inventory. If you open his cell door before talking to him, he won't run or exit the cell, and will ask you to open the door (which is already open). If you don't feel like sneaking around and you are fast enough or have enough armor, you can just run to the cell with the guards chasing after you. You could also cast Paralyze spells on the guards, or hit them with weapons poisoned with paralyze; thus making them unable to follow you. Either way, as long as you didn't kill a guard, you get the bonus. You cannot access Valen Dreth's cell by getting arrested. The cell you're sent to is a different interior cell than the one that you get from accessing the sewers. Valen lacks any eating AI package, so it is not possible to kill him with a poisoned apple. If you try to avoid bounty by sneaking past all the guards, sometimes the last guard in front of Valen Dreth will not walk away after they finish talking. You can save the game, then load it right away and the guard will walk away. 10 I must break into the Imperial Prison and kill a Dark Elf prisoner named Valen Dreth. I will receive a special bonus if I manage not to kill any guards. I can enter the Imperial Prison through the connecting sewers, which can be accessed through a locked manhole just outside the prison walls. Vicente has provided me with a key. 20 I have entered the sewers beneath the Imperial Prison. I must now proceed through the sewers and into the prison itself, and kill Valen Dreth. 40 Valen Dreth is dead, and no guards have been killed. I must return to the Sanctuary and speak with Vicente Valtieri to receive my reward, as well as a bonus. 50 The contract has been fulfilled, but I was unable to prevent the death of any guards. I must return to the Sanctuary and speak with Vicente Valtieri to receive my reward. Unfortunately, the bonus is forfeit. 100 Finishes quest I have spoken with Vicente Valtieri and received my reward. It is possible to use the console to advance through the quest by entering setstage Dark04Execution stage, where stage is the number of the stage you wish to complete. It is not possible to un-complete (i.e. go back) quest stages. See SetStage for more information. Esta página foi modificada pela última vez à(s) 15h50min de 2 de agosto de 2015.